OME-XML is a project to provide support for the exchange of microscope imaging data within the field of life sciences. Its key aspects include support for collaborative sharing of data between labs who may be using different apparatus, and the safeguarding of crucial metadata associated with image files, that can be lost when they are moved across systems (or in many cases, never recorded at all). A data model for representing microscopy metadata, for use with microscopy file formats, expressed as an XML schema. A file format for storing microscopy information (both pixels and metadata) using the OME-XML data model. OME-XML as a file format is somewhat superseded by OME-TIFF, which is the preferred container format for OME-XML encoded metadata. Data saved in an OME-XML file is easily read by any software capable of reading and interpreting OME-XML. OME software tools can export and import OME-XML files, but any OME-XML-aware software can be used. In the figure Data Workflow, microscope image data is imported into My OME Database (more accurately, an instance of OME managing image data at one location). After a set of analyses is performed, this data is exported in its entirety (i.e. including binary image data, image metadata, and the associated analytic results) and then passed to a collaborator’s OME database (“Your OME Database”). This strategy packages analytic data together with the image data to ensure none of the critical interpretative information is lost. 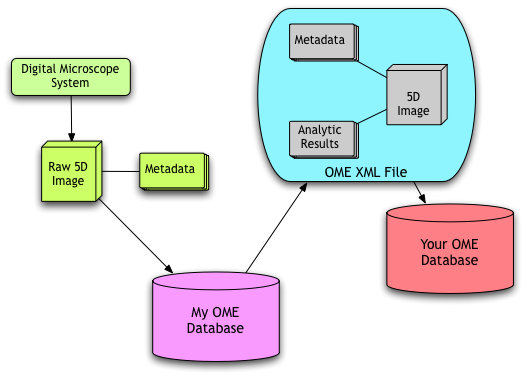 The ongoing development of the OME-XML data model can be tracked on https://trac.openmicroscopy.org/ome. Users can also add work tickets to the system detailing any changes they feel should be made.